Black Friday is when most retailers whip up their most irresistible discounts and deals to entice customers to buy more, more and more. One clothing retailer, though, is using Black Friday as an opportunity to get customers not to buy, but to reuse and fix items they already own. Marketing insanity or marketing genius? Depends who you ask. It will get people in the door, that’s for sure. Patagonia is screening a short film (below) at 15 of its largest stores around the country, from Seattle to Austin to Washington, called Worn Wear on Friday at 5 and 5:30 p.m. The film follows explorers and adventurers and travelers who have worn Patagonia clothes on their travels, highlighting how each of them have repaired their clothing and made it last. “It makes a whole lot of sense to have as little as you need,” says one surfer living in a make-shift camp in Baja in the film, also underscoring the Patagonia mantra. In addition to screening the movie, Patagonia is unveiling this week its partnership with San Luis Obispo, Calif.-based iFixit teaching customers how to repair their gear. For example, the iFixit guide explains how to remove pine sap from a jacket, how to wash wool and how to fix a broken zipper. 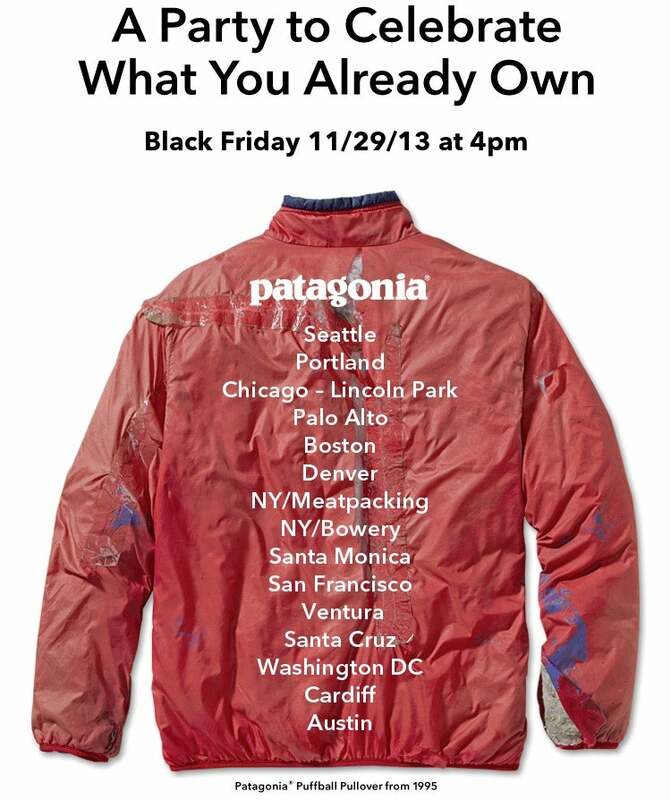 The anti-consumerism tactic is on par with Patagonia’s ethos. The clothing retailer caused quite a stir when it published an advertisement in the New York Times two years ago telling consumers to not purchase one of its most popular jackets.